We all need a little stress – that kick of adrenalin gets you go in the morning and it’s responsible for the kind of motivation you need to succeed. But fast-pace 21st lifestyles mean that stress is ever present – and this can cause damage to mind and body – and that includes your skin. Stress causes a chemical response in your body that causes physical and emotional changes. As far as your skin is concerned, it makes it more sensitive and reactive. Ongoing stress can also make it harder for skin problems to heal. Do you ever notice that when you’re stressed, your skin breaks out? That’s because stress triggers the production and release of cortisol and other hormones one effect of which is on the oil producing glands in your skin, the sebaceous glands. Stress triggers them to produce more oil. And, as oily skin is more susceptible to skin problems like acne, it may be stress that’s behind worsening skin problems including rosacea, and eczema. So what can you do to stress less and help boost your skin health? 1. Drink more. Water that is… One of the many ways that your body naturally detoxes itself is with pure, clean water. Water helps your kidneys, liver and intestines function properly in their task of cleansing the body. It also ensures that your skin can do one of its many jobs, removing impurities and wastes through sweat. 2. And talking of sweat… Exercise is an important stress buster. But it has a dual action because it also helps the blood to pump around the body nourished all your organs including your skin. Aerobic exercise – the kind that makes your heart beat faster – is the kind that does this. Exercise can be a healthy diversion from stresses and boosts the release of fee-good chemicals called endorphins to help raise your mood and lower your stress. But aerobic isn’t the only way to go – stretching activities such as yoga and Tai Chi which involve rhythmic breathing and steady, systematic movements help to boost relaxation. Shower and changes soon after exercise to minimise the length of time sweaty material is left against your skin. 3. Get enough sleep. If you’re short of the ZZZs, your mind and body is not getting enough time to unwind after the pressures of the day. Try to have a regular sleep time. As part of your wind down routine, take 15 to 20 minutes to do some gentle stretches and deep breathing to relax and ease away the pressures of the day. Try to unwind with a good book rather than more screen time – the light emitted from transmitting screens interferes with your body’s natural sleep wake mechanisms and could make sleeping more difficult. 4. Find time for you. Take time for yourself to do something you enjoy, even if you only have ten minutes. And, if you need to, talk to someone. Your doctor can put you in touch with a suitable professional. 5. Enjoy a healthy, mixed diet. Go low – low GI that is! Too many sugary foods and drinks leads to a rapid rise in blood glucose. This in turn means that your body releases insulin to try and normalise blood glucose levels. Too much circulating insulin stresses the hormonal responses and could means and putting the oil gland producing action into overdrive! 6. Nourish with nutritionals. Omega-3 fats help to plump the skin and boost its ability to retain moisture. The result? Fatter, healthier skin. Omega-3s also control the release of irritating substances including leukotriene B4 which is involved with skin problems. 7. Nourish from the outside in. While there is no doubt that nutrition is vital, the skin-boosting nutritionals only get to the skin when all of the other organs have been nourished. So, a great way to provide food for skin is to apply it. Many preparations use vitamin C because of its radiance producing effects. But not all vitamin C products are stable. 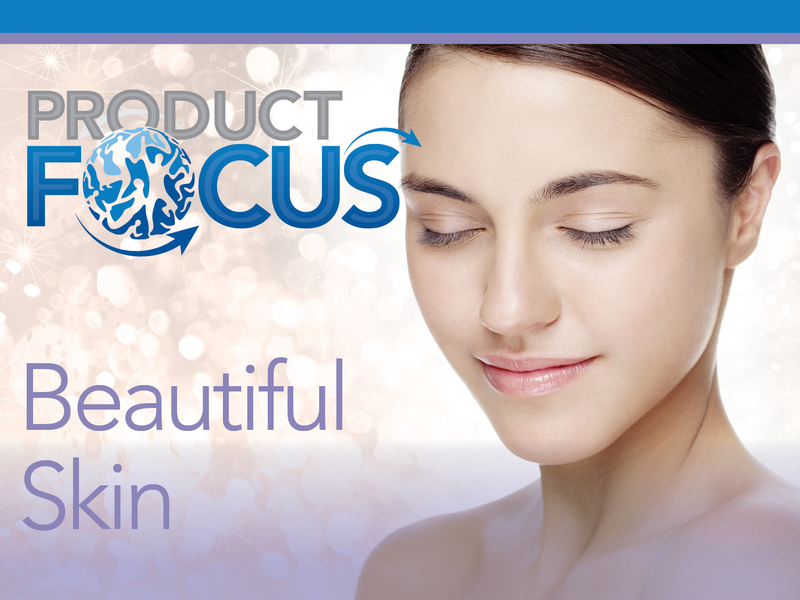 USANA’s Sense™ range is a great way to feed the skin with plant based nutrition and a stable complex of vitamins – including vitamin C.
Our latest issue of Product Focus provides an in-depth information about how you can nourish your skin inside and out. Hop onto USANAToday to find out more and download your free copy of the newsletter and the PowerPoint presentation.